After downsizing your life you may find that you have spare money that you would like to give to charity. There are ways to do this whereby your chosen charity can benefit by not only your money but by gaining the taxable portion as well. Like many people you probably give money to charities when they have special appeal weeks. Your conscience is most likely pricked by seeing people rattling cans while you are out shopping or perhaps by advertisements in newspapers and magazines. However, if you donate money in a more sensible way the charity will benefit through your tax donations. If you pay tax on earnings you can complete a short document whereby the charity you are giving to can reclaim the portion of tax on your donation that you give to charity. Simply by giving your name, the name of the charity and signing to say that you are a UK tax payer the charity will benefit. You will often see this request when you visit stately homes, zoos and other institutions that rely on charitable donations to survive. If you would like to make a regular commitment to your chosen charity, then why not have a donation taken from your monthly salary? Payroll giving is a system organised by the Inland Revenue whereby a set amount is deducted for your pay each month and sent to a registered UK charity. Not only does the charity benefit but you are able to give them more as it is tax deductable. By gifting five pounds the charity will receive this amount but you will only have four pounds taken from you salary. Not only are you paying a regular amount to your chosen charity but they will benefit from your being a tax payer. So many people like to shop or pay their bills online these days so why not donate money to charity this was as well? 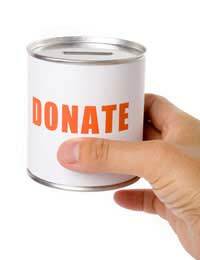 Organisations such as Donation4charity or Just Giving enable you to make charity donations with ease. Not only that if you are arranging an event or are being sponsored for a registered charity you can arrange for those supporting you to pay this way as well thus saving you the hassle of collecting the money after the event. An excellent way to raise funds for an animal; charity is to sponsor or adopt an animal. You don’t actually get to take home the animal; but will receive a certificate and information about the animal from the zoo, sanctuary or organisation involved in the charitable work. This is an ideal gift for a child or that person who is so hard to buy for. Perhaps you would like to support your favourite charity but do not have the spare cash to do so. You could become involved in the charity without donating money by helping them raise funds. Help out by collecting in the high street during special fund raising events, organise a fete or sponsored walk or even help out in one of their shops. There are many ways to give to charity and whatever way you choose will make a difference to the organisation.